It was a beautiful 22C sunny morning in Aqaba and after an early Turkish breakfast at the hostel, we headed out to the beach for a last dip in the Red Sea. 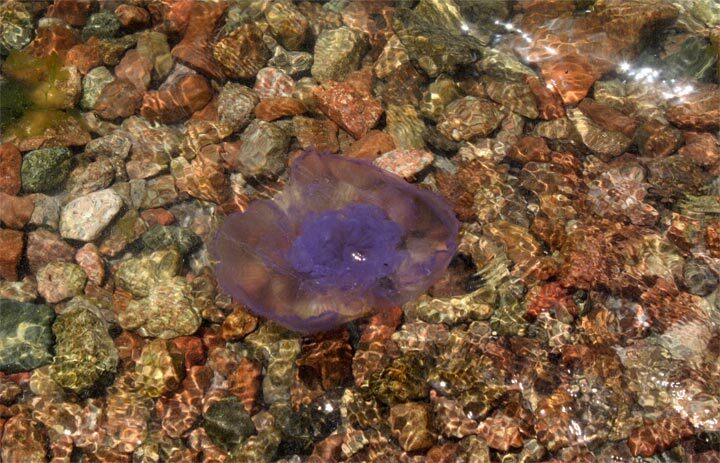 There were a lot of purple jelly fishes washed up to the shore; and since they were not the stingy kinds, we held them for a quick picture and put them back in the water. While checking out of the hostel at 10am, we inquired about taxi to Wadi Musa / Petra at the reception and we were told that it costs JOD 60 (one way) and the other option was to go to the city center and look for private buses that costs a lot less but never run on schedules. We took the second option and after reaching the city center, our cabbie told us that we can find buses to Petra from the bus station (not the JETT bus station) right across from the post office. Note that this is not the JETT bus station so make sure to get down at the post office and walk across the street where you will see private mini-buses (10-12 seater) waiting in the huge parking lot. After asking a few locals we were directed uphill, 2 blocks from the bus stand to another bus stand. The schedules of these buses are not fixed, especially there are a very few buses after noon, so make sure to arrive as early as you can (first bus starts at 6:30am). Also, the bus doesn’t leave until it’s full, but there are passengers always waiting to take the next one so the waiting is not long. Remember that women don’t sit next to men in public transport in Jordan, so while selecting your seats you may be asked to pick another seat or wait for the next bus, depending on the people in it; so plan accordingly. We got lucky because the bus arrived in 5 minutes and the seating arrangement was perfect that got us started in no time. The bus costs varies, but do not pay anything more than JOD 5. If you’re in doubt, ask before boarding. It was a 1.5 hour ride to Wadi Musa, with multiple quick stops because of locals alighting and boarding all the time. 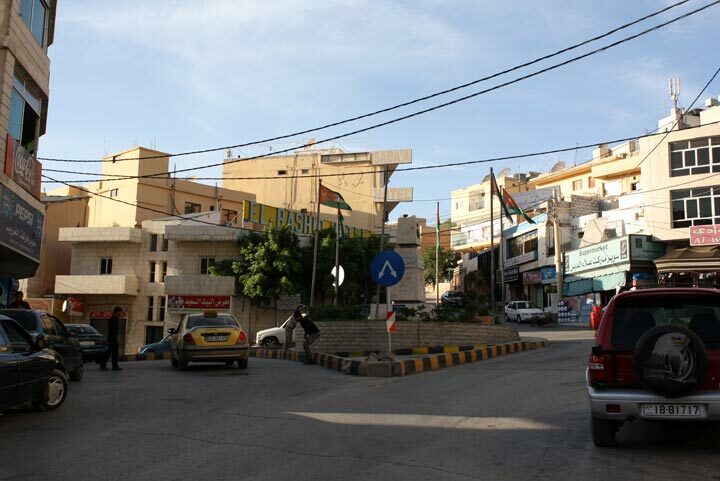 The final stop is Wadi Musa bus station and it’s a bit of the walk to the city center from there. The city of Wadi Musa is on mountains so it’s not easy walking to the center with bags. The bus shuttle of Valentine Hotel times itself to the arrival of the private bus and offers free service to guests living there. Since Valentine Hotel is in the city center and out hostel – Saba’a Hostel – is right next to it, we decided to take the bus for JOD 1 per person. If you’re looking to stay in some place close to the Petra entrance, then this is not the one for you. But the good part is that it’s a downhill walk of about 10-15 minutes to the entrance pf Petra from the hostel and on your way back you will find a taxi for 1 JOD. 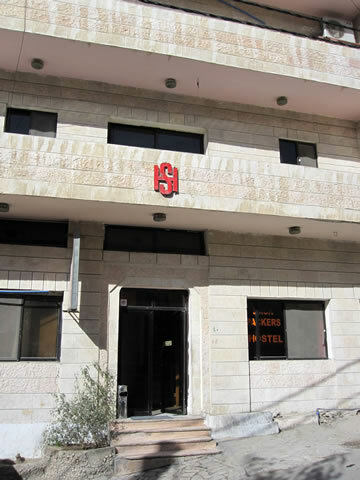 Saba’a hostel is located in the heart of Wadi Musa city center, a stone-throw away from all the shops and restaurants. The other bad part, apart from being away from Petra entrance, is that it’s located next to a mosque, which can get noisy during the prayer calls. Owned and managed by Gail (from Britain) and her husband Ibrahim, this hostel has good and clean rooms – although the one we stayed at had an amazing view in the city center but the fan in the room was very noisy at its max. 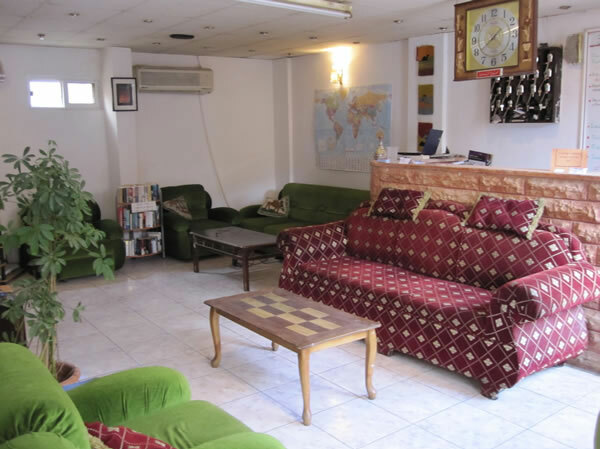 The staff are extremely friendly and very considerate of everything in the hostel. Gail was kind enough to prepare a to-go breakfast of Tuna Sandwich (at a price) at 6a.m., that we could carry with us to Petra, for lunch. They also have water bottles at 0.500 JOD a big bottle, so make sure to carry them with you because everything inside the city of Petra is very expensive (a same size bottle in Petra will cost 2 JOD). The views from the rooftop are breath-taking in day and night, so get some cold-drinks or coffee in the evening and watch the sun set from the nicely decorated rooftop. 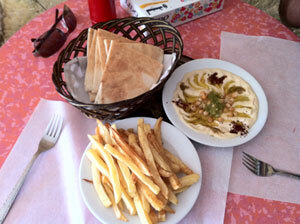 We headed out for lunch at Al-Arabi restaurant right around the corner on the main square. The magnificent city of Petra is a 15-minute downhill walk from Saba’a hostel, so we headed straight for it, hoping to see the sunset from inside of Petra. By the time we reached there it was almost 6:30pm and they close the last entry at 6pm. We knew that it would be a tiring walk uphill to the hostel, and as soon as we started to head back, a taxi driver called out and offered to drop us to the hostel for JOD 1, which we gladly took up the offer. After a long, yet relaxing day, the rooftop of the hostel was a great place to relax and the sunset is spectacular. Stay up late after sunset for a cool breeze and great views of Wadi Musa at night. After some juice in a nearby restaurant, we were off to sleep, excited to wake up early for a day at Petra.